Black and white police officers have strikingly different views on a number of important issues related to their jobs, including recent fatal encounters between law enforcement and black citizens and the protests that those encounters have sparked, according to a new Pew Research Center survey. On some subjects, racial differences among the police are considerably more pronounced than they are among the public as a whole. Black officers are about twice as likely as white officers (57% vs. 27%) to say that recent deaths of blacks during encounters with police are signs of a broader problem and not isolated incidents, according to the survey of nearly 8,000 sworn officers working in departments of 100 officers or more, which was conducted on behalf of the Center by the National Police Research Platform. 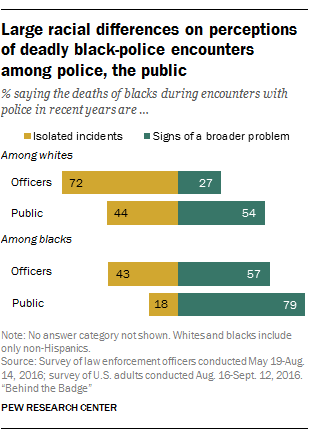 The general public is also divided by race on this question, but majorities of both blacks (79%) and whites (54%) say recent fatal encounters are part of a broader problem and aren’t isolated incidents. Views of the protests that have followed these encounters also differ sharply by race, especially among police. About seven-in-ten black officers (69%) say that the protests are motivated some or a great deal by a genuine desire to hold police accountable for their actions, compared with just 27% of white officers who hold this view. Among the general public, 79% of blacks and 63% of whites say the protests are motivated some or a great deal by a genuine desire to hold police accountable. 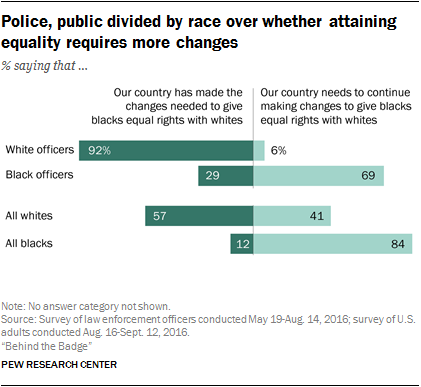 On the broader question of overall race relations in American society, the overwhelming majority (92%) of white officers say the U.S. has made the changes needed to give blacks equal rights with whites; just 29% of black officers agree. The general public is divided along racial lines on this question, too, but not as much as police officers: About six-in-ten whites (57%) say the country has made the changes needed to bring about equal rights for blacks, compared with just 12% of blacks. Specific policy debates related to policing also bring out important differences in opinion between black and white officers. Black officers, for instance, are substantially more likely than white officers (71% vs. 46%) to say that body cameras – which have been promoted as a way to improve police accountability – would make officers more likely to act appropriately when dealing with the public. Even on the more individualized and personal aspects of their experiences as police officers, black and white officers differ significantly on many questions. White officers, for example, are substantially more likely than black officers (60% compared with 32%) to say that relations between blacks and the police in their communities are excellent or good. White officers are also more likely than black officers to say they’ve been verbally abused by a community member in the past month (70% vs. 53% of black officers); to say they’ve struggled or fought with a suspect resisting arrest in the past month (36% vs. 20%); and to say they’ve fired their service weapon while on duty at some point in their careers (31% vs. 21%). There are also notable racial differences in the way police officers describe themselves. White officers are much more likely than black officers to say they’ve become more callous toward others since joining the police (62% vs. 32%) and to say they are often or nearly always frustrated by their work as a law enforcement officer (54% compared with 41%). Black and white officers have notably different views when it comes to the way their departments handle personnel decisions, too. About half of black officers (53%), for instance, say their white counterparts are treated better than minorities when it comes to assignments and promotions; just 1% of white officers agree with that assessment. While there are racial differences among police on many questions, it’s important to note that black and white officers do agree in other areas. Nearly all black officers (98%) and white officers (96%), for example, agree that they are strongly committed to making their agencies successful. Large majorities of both groups (81% of blacks and 89% of whites) say their jobs have become harder in the wake of recent high-profile incidents involving law enforcement and black Americans. And large majorities of black and white officers (87% and 86%, respectively) agree that their agencies don’t have enough officers to police their communities adequately.